At around 4:30am on July 13th, I could see a really beautiful sunrise at Shirahama beach. Before coming to Shimoda I wanted to see this scine which I saw in Sakuraya’s webpage. We stayed in Shirahama for 4 days and could see it on a last morning at last because it had been cloudy for 3 days. This place is behind Shirahama shrine, and there is a red gate "Torii" on the big rock. We can see Izu seven islands from here, and this gate seemes like a place to meet gods from these islands. When I took this picture the sun had just been rising. Actually I did not take this picture. Our guest came from Tokyo went to the beach in early morning to take this picture, and sent us this picture to us later……. . 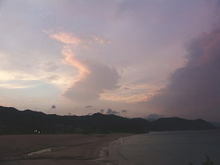 This entry was posted in beach, nature on 2006年7月30日 by izusakuraya. It had been sunny in these 3 days here in Shirahama. When the weather is good there are a lot of beach parasols in the beach. And the area of the parasols are becoming to spread day after day. This entry was posted in beach on 2006年7月27日 by izusakuraya. When will be the rainy season over ? Last year it had been already finished on July 18th, but we are still in the rainy days this year. *sigh* …. . 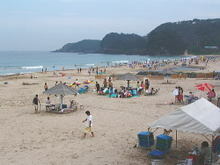 However we could sometimes have sun today, so our guest could go to the beach and swim. This entry was posted in beach on 2006年7月22日 by izusakuraya. Since yesterday we had benn having a heavy rain in Shirahama. Actually I was going to take a picture of Shirahama beach today when I went to Shimoda, but I could not do it because of rain. In these days I always show you the pictures of Shirahama, so I introduce the another one today. This is "Sotoura Beach" located in a small village between Shimoda town and Shirahama, which is one of 9 beaches in Shimoda, and it takes about 10 minutes to the nearest bus stop from Shimoda train station by bus. They usually don’t have big waves here because this beach is in a creek (a small bay). They provide one thing to play in this creek in summer, and we can have a fun with it. 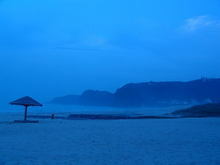 This entry was posted in beach on 2006年7月19日 by izusakuraya. A beautiful summer day, Shirahama Beach !! Yes, it has come to Shirahama today at last !! Today, it was a first day of 3 holidays in Japan. We were worrying about the weather of today, but it was very beautiful day. "I must take a picture of beach !" We were very busy today, but I went to the beach to take pictures. This entry was posted in beach on 2006年7月15日 by izusakuraya. 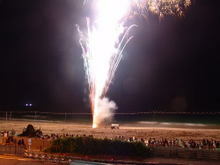 On every 2nd Saturday in July a Fireworks Festival "Hanabi Taikai" takes place in Shirahama beach. This fireworks is held as one of events which tell you a summer is coming. We are worrying about the weather every year, becaus it is still in a rainny season. Actually it was rainny last year, but the rain stopped 5 minutes before this festival. It was really amazing. 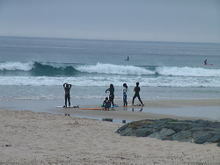 This entry was posted in beach, Travel on 2006年7月10日 by izusakuraya. Is a typhoon making good waves ? Now, the typhoon No. 3 is going on the west side of Okinawa toward China or Korea. We were worrying that this typoon would get on Kyushu, Japan this time. By the way this typoon is probably making good waves in Shirahama today, so there were a lot of surfers in the sea. 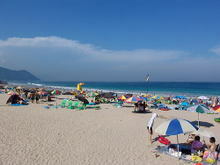 Today is not holiday, but why could they come to the beach in the afternoon ? Are they in a holiday ? Or they don’t have jobs ? …….. This entry was posted in beach on 2006年7月7日 by izusakuraya. 7:00pm in the afternoon, it’s a time which has already dark 7:00pm in winter. But when I went to the beach I found a fog coming up from the sea. Actually I took this picture the day before yesterday, and I was going to post it in this weblog last night, but this weblog service didn’t work for 8 hours. So I am posting it today at last, because this is cool picture, I think. By the way I went to the beach today too……. 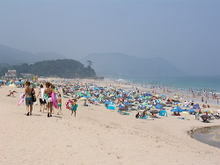 This entry was posted in beach on 2006年7月6日 by izusakuraya. Today, my daughters had a class of classical ballet in Shimoda. My wife usually takes them to the school, but she was going to cook for dinner today, so I took my daughters to Shimoda. This is a picture that I took at Shirahama beach in this late afternoon. The sun made a sky light pink and the cloud seemed like a dancing whale. ….. This entry was posted in beach, nature on 2006年7月3日 by izusakuraya. Today, July 2nd, Sunday, the concert of Tokyo Philharmonic Chorus which is professional in Jpan, took place at Shimoda civic hall. I joined this concert as a member of Shimoda civic chorus group which participated about 100 people from many places in Izu peninsula. We sung 4 songs together on a same stage, but the voice of this professional chorus was really gorgeous. This is one of 50th aniversary concerts of this professional chorus. 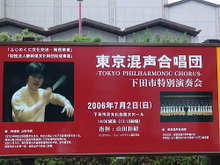 This 1st picture is sign of this concert which is placed in fron to civic hall. This entry was posted in Family on 2006年7月2日 by izusakuraya.